We are almost at the end of the great Lent, a period of spiritual preparation for our participation in Christ’s death and resurrection through fasting, repentance, prayer, reflection and charity. Our efforts during this holy season are to become more reflective than active, to focus our efforts towards those virtues, values and relationships that allow us to come closer to God and each other. In Christ’s death and resurrection, the boundless love of God for the world is fully expressed and communicated to all of us. As Orthodox Christians during the Holy Week, we reaffirm our faith in the crucified and risen Son of God and embrace those values, beliefs, and virtues that bring the fullness of life not only to us but the whole world. The resurrection of Christ irrevocably plants in our lives the hope that transcends the limitation of this world and refuses to give a sense of finality to the afflictions, violence and barbarity of history. Christ is risen from the dead, trampling death be death, and bestowing life on those in the graves. We hope that you will come to our historic and beautiful Church to pray with us, prepare to receive the body of Christ, be anointed with Holy Unction on Holy Wednesday, participate in the services of Christ’s crucifixion, unnailing from the cross, and burial on Holy Friday evening, celebrate His glorious Resurrection on Holy Saturday night, and the Agape service on Easter Sunday. 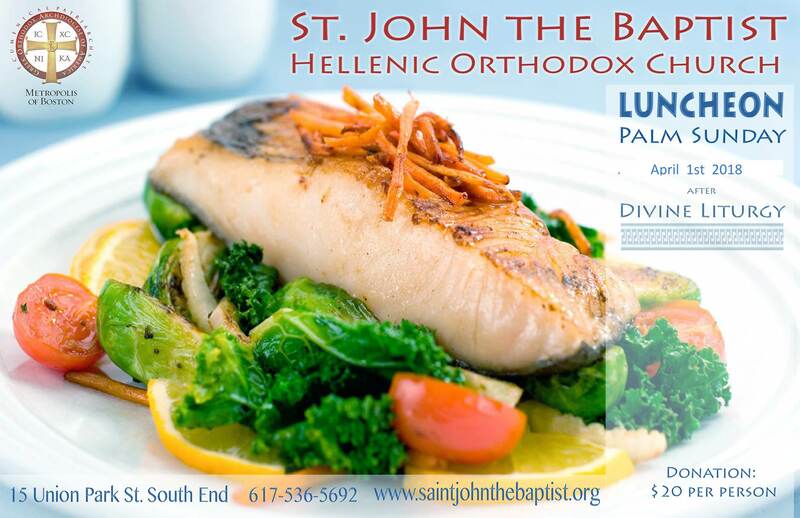 On Palm, Sunday, April 1st, all the friends and parishioners with their families are invited to the traditional Fish Luncheon at the Church hall. Please call the Church office and made reservations as soon as possible. Donation for the Luncheon is $20 per person.